Mobile phone camera-based document video scanning is an interesting research problem which has entered into a new era with the emergence of widely used, processing capable and motion sensors equipped smartphones. 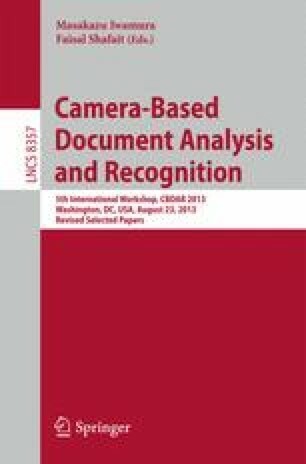 We present our ongoing research on mobile phone camera-based document image mosaic reconstruction method for video scanning of paper documents. In this work, we have optimized the classic keypoint feature descriptor-based image registration method, by employing the accelerometer and gyroscope sensor data. Experimental results are evaluated using optical character recognition (OCR) on the reconstructed mosaic from mobile phone camera-based video scanning of paper documents. The piXL project is supported by the “Fonds national pour la Société Numérique” of the French State by means of the “Programme d’Investissements d’Avenir”, and referenced under PIA-FSN2-PIXL. For more details and resources, visit http://valconum.fr/index.php/les-projets/pixl.